Dave Billings believes that many of the best product designs have their roots in history, and branch out with new innovations creating a magical combination of something old, something new. Some call products with this design philosophy “Retro”. The historical anchors make the products familiar and comfortable. In golf, this is important for a club to “look right” which is the first objective for most golfers when looking for or trying a new club. The innovations can spring from the classic roots, but need to do so in a cohesive way, so they look as if they not only belong together, but are simply meant to be. It may sound simple, but that’s in practice it presents a significant and constant challenge. And the more successful the original host, the more challenging the enterprise of making it new again, and especially in making it better. Dave’s favorite putters of his early years in the golf industry were the PING® Anser models, and he believes those historic putters are the benchmarks for a vast array of putters that have followed them, including many of the current market leaders. Other makers have simply mimicked and improved certain aspects, such as improving the materials and processes, as with going from cast to milled. Others have pushed aesthetics by adorning classic designs with loads of stamps and paint fill. Dave’s goals are different: to modernize the classic and historic designs with new technologies and design concepts to offer even greater levels of improved performance, feel, fitting, personalization and customization options previously not available. 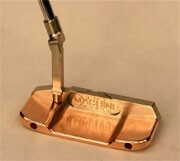 Many of Dave Billings’ MACHINE Putter designs start with the classic and time honored Anser-style head shapes. Case in point, the M1A line of Adjuster (adjustable-weight) and Fixer (fixed-weight) putter models begin with the anser2-style head design, but then Dave’s technologies provide a wide variety of interchangeable necks to match user preferences and needs for critical fitting and performance aspects such as offset, head balance and toe hang, lie angles, shaft lean, alignment marks, etc. Adjusters have user-adjustable weights and even most Fixers can adjust the sound and feel, alignment and weight via the Logo Exchange medallion cavity port and a whole host of medallions, ATM’s (alignment tongue medallions) and “Feel Chamber”TM inserts. Likewise the M2A Converter models begin with anser2-style design cues, but are deconstructed and then reconstructed by Dave back into three basic modules of the base head and separable, weight adjustable flanges, and interchangeable necks (as well as adjustable weights and interchangeable logo medallion). 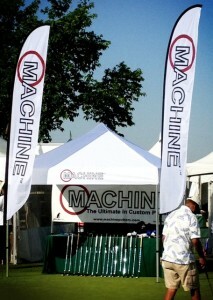 These innovative technologies are patented and have other patents pending, making them unique to Dogleg Right and MACHINE Putters. * The possibilities and options expand exponentially from there, with convertible and transforming shape options ranging from subtle to extreme, classic to ultra-modern, with high MOI back flanges and even more advancements in alignment aids and strategic weight relocation designs. Innovations of internal milling and advanced milled groove options on the face also are available in these and other models. Revival models M4, M5 and M6 diverge from this pattern by offering unique Billings designs that draw inspiration from other historic putters, but are unique and classic in their own right. The M4 Meritage is a blend between blade and mallet. It starts as a “chopped” version of the M2A, where Billings further deconstructs the classic Anser2-stle putter to allow for larger, more mallet-like flanges. The result is a beautiful blend of old and new, classic, yet modern. The M5 Designer is a “revival” of the original HOG 1005D, a putter used to win Championships on Tour and in the hands of several Hall of Fame golfers. It comes back to life with interchangeable hosels and a range of materials and finishes, alignment options and of course shaft and grip choices. The M6 Inspirer is a morph of several design styles, and another revival of the original HOG Model 1006. The 1006ibCH was inspired by Team MACHINE member and Army Staff Sergeant Christopher Hoeppner, who loved the head but needed a Center Shaft setup to fit his specs. We are honored to have Chris on our Team and to offer this special limited edition he helped inspire. The new M8 and M9 models draw their inspiration and roots from the classic 8802 and TPA XVIII putters respectively, as well as many more modern renditions of these time-honored and time-tested models. Again, Dave then deconstructs them, converts them and modernizes them like no other. The M10 Adjusters and Fixers and M20 Converters follow a similar path that the M1A and M2A putters take in modernization, except they take their roots and inspiration from the historic Scottsdale Anser “Dale Head” design, a softer look so appreciated by countless golfers over the years. Their reconstruction offers new more forgiving, easier to align and more customization options for the player who prefers this style, but desires something more, something better. In addition to the models listed here and shown in on the site, Dave and Team MACHINE are always exploring new technologies, designs, models, creative “mods” to continue to push the boundaries of design, innovation and performance. Dave also designs other golf related accessories including our Green Tools and does all the logos and design work for head covers, hats, shirts and towels. You can find those in our products section, with lots more in the works and coming soon! Look for new models, and more classic and traditional designs as we expand our lines to meet your ideals for the Ultimate in Custom Putters! PING® and Anser® are a registered trademarks of PING Golf, USA.